Your constant companions are the magnificent trees and forests, rolling hills and green grass. We are back! We, Rose Parker and Penny Webb from Kinwomen snuck away from our Perth families and homes to go ahead of the Kinwomen Wild Weekend scheduled on 2-4 November to find some great spots for you and your friends. Take 3 – we thought we would just highlight a few things happening in town on Saturday, direct you to some good food spots and just ‘things you could do’ on Saturday. Farmers Market – Open on Saturday and is located right in the heart of town and next door to the Visitors Centre – look for the large white marquee. Based on the Seasonal Calendar, for November we can expect to buy asparagus, beetroot, broccoli, cabbage, cauliflower, herbs, kale, Kohn Rabi, Lebanese cucumbers, silverbeet, Avocados, Cherries, Strawberries and always beef, cream, eggs, honey, lamb marron, milk, olive oil, Rainbow Trout and Red Fin Perch! Southern Forest Food Council – this is the shop front promoting all local produce in the area and doing a fabulous job of bringing local producers together, creating partnerships and business opportunities. The Cherry Box – we couldn’t get in the day we were there, but we had a good look through the window and it looks like it has some good things to taste-n-see that the Cherry-Box is good! Southern Roasting Co. – Grab the best coffee in town. They are open for Brekkie and a lunch bite. We shared an excellent toasted Rueben sandwich. Say a big Hi to Ian and April, who are good hosts, and tell them Kinwomen sent you. This is one of the venues where we are holding the afternoon workshops. You can buy their locally roasted some coffee beans to bring home – a nice gift for the coffee-lover in your family. The CWA Manjimup (on the main street) – just glimpse a super little building with many stories to tell, we are sure. Cows sheep and a few friendly Llamas! 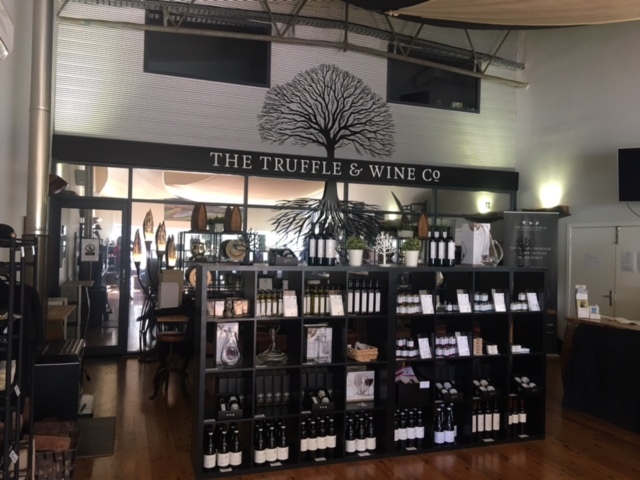 Manjimup Wine and Truffle Company – A great cellar door experience hosted by Stuart and his trio of Truffle dogs… Labradors … Rosie , Gunner, and you can find out the name of the black lab because we missed that one! Taste local wines and truffle-inspired products from the region which produces the best quality black truffles ‘In The World’ and provides 80% of the Southern Hemispheres Truffle demand. How brilliant! Great restaurant here also serving lunch from 10am to 3pm. If you are a gourmet foodie you will not want to miss this !!! 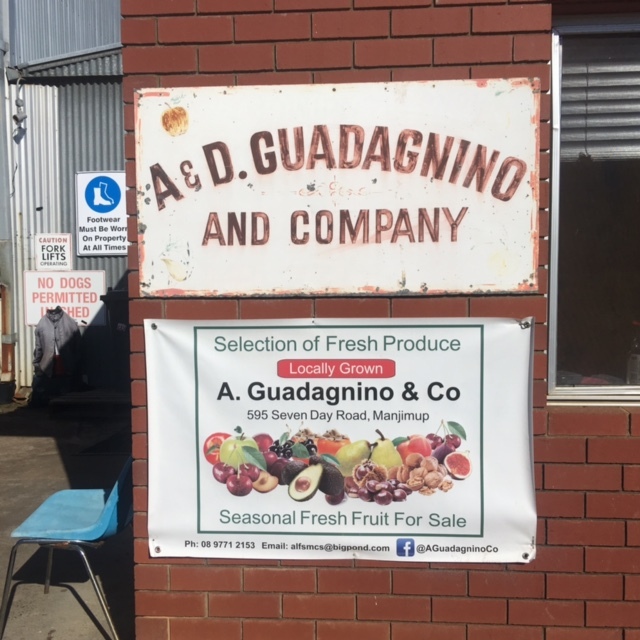 Guadagnino Co – This family are fruit and vegetable growers. It’s a large working warehouse with a small shop and located inside is where you can buy fresh-picked produce in season, local honey and handmade tea towels. This is a local hardworking Italian family who greeted us like we were family…. offered us a short black and invited us in to the family lunch table to sit for a while. We learnt of hard work and history and the reason for it all… Family. I (Penny) interviewed Ray on raising girls! Look out for that gold!!! You will know you have arrived when you see the white fence and the Australian and Italian flags at the entrance. Dingup House – Who would have guessed that our Wild Kinwomen Weekend would coincide with the Open Home and Garden Weekend. The fabulous Dingup House was built by the Giblett family in 1847 and is just outstanding where it sits on a hill. 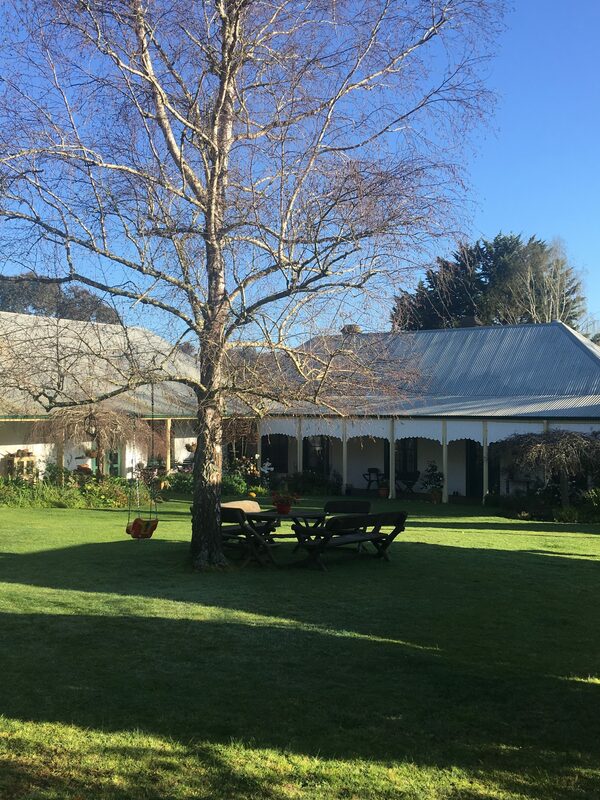 The Dingup House is open Saturday 3rd November and serving Devonshire tea in the gardens from 10am to 2pm; $5 (Garden entry) and $12 for afternoon tea served on the front lawn. Dingup Church – Just a 3 km drive from Dingup House is the beautiful Dingup Church … a 100 year-old stone Church built by the Giblett family also because too many people were attending the church service at the house! Read the plaque for its history and marvel at the tenacity and vision of our early settlers. Tree Top Walk – If you get up early on a Saturday or Sunday you may well fit this excursion in. The tree-top walk soars 40m into the forest canopy and opens up a world most people never see. It’s one of the sites in the Walpole Wilderness Discovery Centre – so a little drive, but for the adventurous, you just might love it. 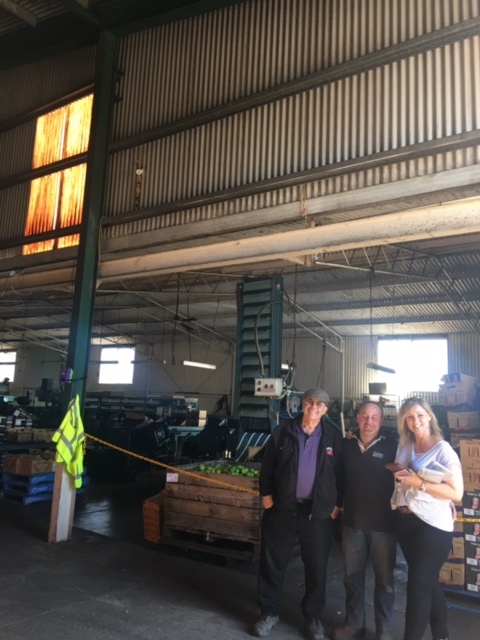 Manjimup Timber and Heritage Park – We had a ball here! Open from 9am – you could take a picnic or have a BBQ breakfast, lunch or brunch. Take the walks and see the variety of native wildflowers (10 hectare of parkland) visit the museums and then get wild and go to the top of the Fire Lookout Tower and then come down the stainless steel, fast slide! Check out the videos on Facebook of our slide experiences! There’s a Regional Visitor’s Centre (08) 9771 1831 and website www.manjimupwa.com you can check out to find out more of what is happening that weekend. Tall Timbers – This is the most accessible place in town as it offers breakfast, lunch and dinner, 7 days a week. Very new with hard working staff and good décor. It’s has a winebar/gastro pub vibe with good nooks and crannies to gather together inside and out. Southern Roasters Co. – Open for Breakfast and Lunch only… shuts at 2pm. Awesome coffee and great toasted Rueben sandwich. Lovely hosts, Ian and April, and you can buy locally roasted coffee beans to take home. The Blue Tiger – Brekkie and lunch Only. (Not open Sunday) For the health and nutrition foodies. They do smoothies, juices, vego options, yummy curries and food that changes weekly. Homemade ice cream has to be a bonus! Buy Local and Cook – For those of you who have kitchen facilities at your home-stay or B & B, you could buy local produce and cook up a storm back at the ranch! So that’s over and out from us for now. Love to see you at the Kinwomen Gone Wild Roadtrip – Manjimup Weekend – 2-4 November 2018. Bring a few friends or go onto our Facebook Event Page and ask if anyone is looking to share a lift or a few of you share accommodation. BOOK TODAY – LINK HERE.